Ancestral Quest 15 is a major upgrade to AQ. It offers some very helpful new features to the program. Details on these new features appear below. Have you ever wished that your family tree program could just do your research for you? Introducing TreeTips: technology built into Ancestral Quest that will search the world's major repositories of genealogical records and let you know if there are any records for you to examine. TreeTips combines the hinting capabilities of MyHeritage (based in Israel, with over 6 billion searchable records), FamilySearch (based in Utah, with over 5 billion searchable records) and Findmypast (based in England, with nearly 3 billion searchable records). What do you have to do? Just start entering what you know about your family history into Ancestral Quest and let TreeTips examine over 10 billion records, suggesting where you could look next, as you expand your tree and discover your family heritage. As AQ finds records for you on one of these sites, it will show you an icon next to the name of the ancestor to whom the record relates. Simply hover your mouse over the icon to see how many records are available, and click on the icon to see actual records. For more details on this exciting new feature, visit the TreeTips page of this site. Note: While receiving hints from all these sites are free, accessing some records may require a subscription or other fees. Do you have ancestral photos, documents and stories to share with others, and have you wished there were a quick, easy method of uploading these to FamilySerach, for the benefit of your extended family? Have you found that distant cousins have shared such memories about your ancestors on FamilySearch, and have you wished there were an easy way to download these family treasures to your computer? Introducing Memories Manager: view the stories and scrapbook items you have collected in your local family tree side-by-side with the memories for the same people in FamilySearch, then upload or download memories with the click of a button. If you need to store your memories offline, so that as you share your family tree records with others, the links to scrapbook items will not require you to also find a way to transfer the files, Memories Manager provides a means of linking the scrapbook items in your file directly to the files in FamilySearch, so it doesn't matter whether you transfer the original files when sharing your database. Watch a video showing you how Memories Manager works! The Family View of the program now shows additional information. In the Child list, to the left of the child, there appears an arrow. If the arrow is not filled in, then it means that the child has no recorded posterity. If the arrow is filled in, then it means that the child does have recorded posterity. If there is no dot in the upper-left corner of the box, then the child does not have a recorded spouse. If the left arrow has an extra < next to it, this means that this is the child who was in the Primary position previously -- it indicates the path you followed to navigate to the current family. This enhancement was asked for by many users, so we indulged them. You can now use the Individual Merge tool using either the over/under display (as in the most recent past versions of AQ), or the original side-by-side comparison view. We have heard from many users that they would prefer the side-by-side display, so we obliged! 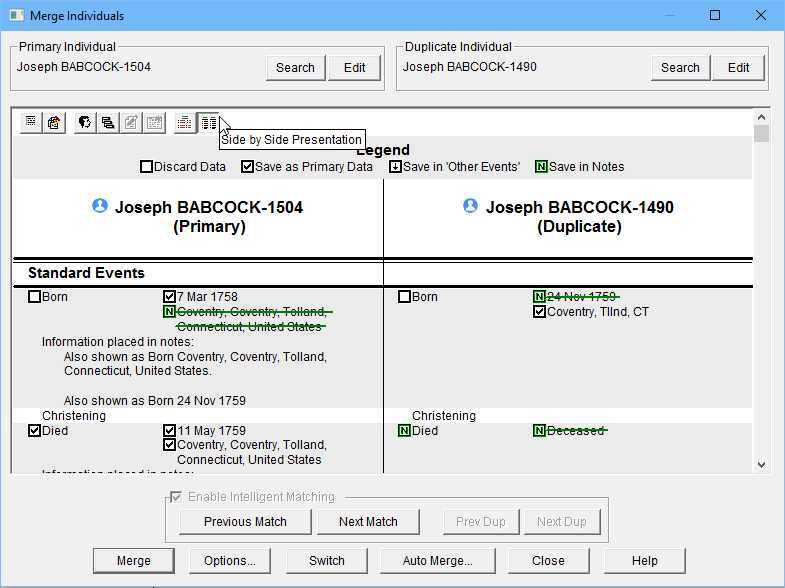 The Memories Manager and FamilySearch hinting, part of TreeTips, are two of the new tools in AQ 15 for working with FamilySearch Family Tree. Below are some additional enhancements. 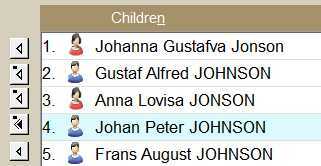 Append to Names: In earlier versions, you could append either the individual's RIN from your own database, or the FS PID (FamilySearch Person ID). Now, you can choose to display both the RIN and the FS PID after the individual names. Import Family Lines: In earlier versions, when you wanted to import ancestral family lines, you could only import ancestors of a single end-of-line person. If you wanted to extend the lines of your father, but you already had 3 more generations past your father, then you had to select all 8 end-of-line persons past your father, one at a time, and import their lines. 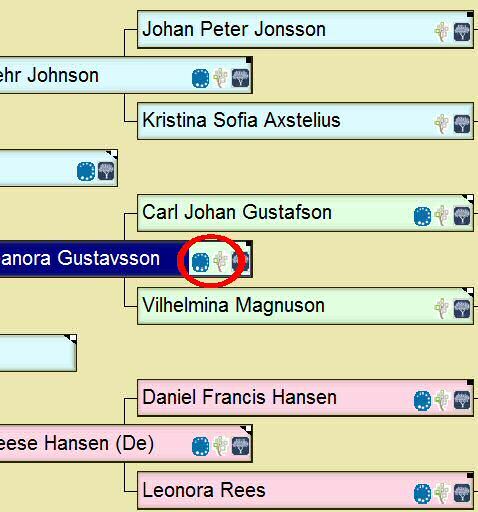 With the new "Add Ancestors to all linked end-of-line ancestors of selected person" option, you can select your father and have all 8 lines extended using a single request. If you have already obtained a version 15 key, download and install Ancestral Quest 15 using the steps outlined below. You can download and install Ancestral Quest 15, using the steps outlined below. All of the features you have had access to in AQ 14/12.x will still be unlocked in AQ 15 with your current key, and you will find some new improvements and minor enhancements, but you will not be able to use the major new features of AQ 15 unless you purchase an upgrade for your Registration Key. You can purchase an upgrade for your Registration Key, which will unlock the major new features of AQ 15. You should download and install Ancestral Quest 15, using the steps outlined below. All of the features of your current version of Ancestral Quest Basics will be available to you and you will find some new improvements and minor enhancements; however, you will continue to not have access to those advanced features that require a current Registration Key. You can purchase a Registration Key, which will unlock the advanced features of AQ 15. Close Ancestral Quest, as the installer will need to replace it. Download AQ15Setup.exe (the installer), using the button below. Run the AQ15Setup.exe file to install AQ 15. If you have purchased an AQ 15 Registration Key, when you start up AQ 15, go to Help, then Register Ancestral Quest, and enter your new AQ 15 Registration Key. View the Frequently Asked Questions page on upgrading to Ancestral Quest 15.